Soloed this a couple of years ago. I thought the route was great. It was crowded up to where it branches off, then the awesomeness begins. The move out of the cave to start the route proper was somewhat blind, then swing out and partake in the rivet/bolt ladder for a pitch and a half. There is a 5.7 mantle, but a old rusty pin can be aided off. I set up the ledge after the "bush" (P6) which actually hauled OK, I thought the bags would get stuck for sure, but not. The wide was aided with big cams and a bat hook. The pitches up to Clance Stance were the best on the route. The crux pitch after had a big loose flake in the middle, very hollow sounding. The last pitch was bomber, and the exit chimney was dirty and loose. Watch the haul here as to not knock anything down the South Face! It want hammerless with cam hooks and a couple hand placed beaks (med). A couple of big cams for the 4.5 section is fine. The descent is what it is, I shuttled gear down in two loads. Not as good as the Prow but not crowded either. Good exposure. There was a fixed rope in decent shape from Dinner to the top of P5 as of 2018-04-25. Necessary fixed heads weren't scary looking. There's also a head to bypass a mandatory free move -- but if I can refuse to clip it despite being a gumby that's afraid of free climbing, you can shun it too. More rap beta: from the pitch 5 anchor at the end of the bolt ladder it is possible to make a single line rappel with a 70m rope to the very right side of dinner ledge. Just to be clear, I'm talking about fixing a single 70m rope to the anchor, not doubling the rope and rapping from the middle mark. With two 70m ropes you could reach dinner ledge and pull to retrieve them. Fixing to the top of p5 bolt ladder on day 1, then sleeping on dinner ledge and climbing the rest of the route on day 2 make for a fairly mellow outing, leaving enough time to rap back to dinner ledge to get your bag, finish rapping to the ground, and hike off on day 2 if you climb at a good pace averaging around an hour per pitch on a day with long sunlight. You must free climb the p11 lie-back flake! It is the icing on the cake of this route! True munge. I am 6'4", however, with nuts you also get an extended reach with the wire so I wonder if that evens it out. Also they weren't very far apart. "We didn't use one. We used nuts instead." Briham, you might tell folks how tall you are, or alternatively if you have a positive ape index. Using nuts rather than hangers leaves you shy a few inches each placement. there is a loose block on the real first pitch of skull queen when it leaves south face and goes up the bolt ladder. it is pitch 5 in the topo. 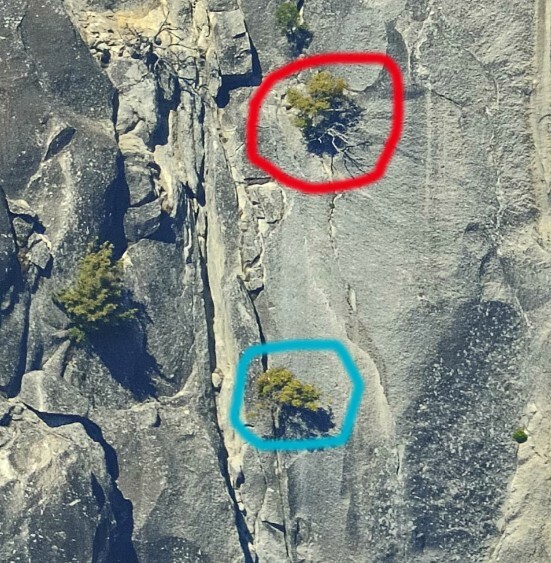 be careful about lower partys because it is right above the most popular wall in yosemite! So on the south face topo where it says "if rappelling route start here" that is the top of pitch 11 of skull queen. So rapping skull queen back to dinner via the south face is a piece of cake. HOWEVER some more beta that might be useful.... when looking at the skull queen topo where it shows the pitch 10 anchor of the south face next to pitch 11 on skull queen is incorrect. The top of Pitch 10 of the south face is directly across from the top of pitch 10 on skull queen. Also it says from the first south face rap that it is 60m to 10...nope. It's a little less than 60m to the top of 9. So don't stop at 10, go to 9. Also we used the suggested rap route to the right of the south face by pitch 8 and 7, and this did not take us down to 6 (we were way to the right). We ended up having to rap skull queen, which involved some work to get down pitch 5. The route was very enjoyable! A nice step up in difficulty from the leaning tower or the prow. The c2+ pitches involved some fun cam hooking, and I placed my first hand placed hawk on pitch 10. I hear it's a slippery slope and might end up with 40 hawks soon... Anyways if I were to do it again I would only bring one large hawk / beak. Also you don't need 14 rivet hangers. We didn't use one. We used nuts instead. I climbed it with Mickey (aka WhiteMeat) and he removed two heads using a "Mark Hudon butter knife." There were bomber placements right next to them. So the route is now a little cleaner! Trip report coming soon to a forum near you! I have heard (not personal experience!) that from near the top of Skull Queen you can swing over to the S Face and rap that back down to Dinner ledge. Or you could top out and walk over to the S Face and rap straight down. I have wanted to do a Dinner ledge basecamp, to Southern Man-S Face-Skull Queen. Lotta climbing for only 3 hauls. Let us know if this works! Anyone know if rapping this route is a good idea? It would be nice to leave the pig on dinner and rap back to it. Any loose stuff near the top or rope eating cracks? I don't mind hiking NDG, especially if I'm going to kill someone on dinner. What say you taco heads? Does anyone know what happened to the Skull Queen left up on the wall from the original groupies? When I did this route August 08' There were a total of 7 heads. One placed at the mantle on six which I did not use. One on pitch 8 toward the top of the crux. Three on pitch 10, #1 and #2 at the top of the pitch before you traverse on the 1/4 inch rivets left to the belay. Amazing how a route accumulates so much so fast. Good job on the send, That last pitch would be a *** classic on the valley floor! Did this the first weekend in April. Overall it was an enjoyable route and we had a good time. We brought along the portaledge to send it on its maiden voyage. We bivied above the bush/tree at the top of pitch 6 and fixed 7 and 8 for the second day. I led the whole thing with my girlfriend on the jugs. I enjoyed the route but felt like it had an unnecessary amount of rivets and copper heads. The pitch 5 rivet ladder is necessary as are several other sections of rivet ladders. Unfortunately there were at least a dozen copper heads, all but 1 or 2 were so unbelievebly unnecessary. I often placed a bomber cam above or below the heads or somewhere nearby that made it a shame it was there. In addition there was some bad botch jobs done on rivet replacing in many spots where rivets were just smashed down and if they were covered it was with a crummy patch job. Like I said, the climbing was good and enjoyable, but the excessive heads and rivets really detracted for me. Last note, take free shoes and free the last pitch, it felt a little soft for .10c and was a totally beautiful layback on a thin flake, when the climbing eases at the top of the pitch the flake becomes paper thin and provides some fantastic free climbing. A bunch of fun, good way to step up your clean aid before jumping into C3. All the falls were clean through the tuffer sections, and usually protected by bolts at some point during your fall if you blow mad pro. No head up through pitch 6? mantel. There is a bomber nut placement, and the mantel is easy. Probably more than half the heads are gone/unusable, I didn't use any and didn't have any problems bypassing the moves. The seam on pitch 6 is seeping now and a little unnerving. Bring bunches of micros. Offsets useful. Bring a 4.5". The OW section on pitch 7 is more of a chimney, not aidable unless you have a big bro. The whipper without the 4.5 may be into the trees below. Bring Cam hooks, sky hook, 12 rivets sounds like a lot but you may drop some. I found trips of yellow alien size (yellow TCU and C3?) to be useful. --Fun route! Get up there soon enough and maybe you'll find a few of my micros that I donated as an offering to the wall gods. Just bailed from the top of pitch 6 but started up pitch 7 on 5/1/08. Just a few things. P6- Someone put a head at the 5.7 mantel so it's really easy now. There is only 1 other head on the pitch and it's not going anywhere any time soon. The tree on the topo to the left of the P6 anchor is under the anchor and you have to climb and haul through it. I would link 6 and 7 together and pass the haul line around the tree and haul from there. Anbody been on this recently? Still in Yosemite Valley? Still made of stone? any additional commentary welcome. thanks. Climbed this route over the past weekend. Everything was just as I remembered- no surprises..... straight forward climbing. No loose flake to be wary of that I noticed. The last bolt on the Kor roof is coming untightened so do a good deed and bring a wrench when you head up. All fixed heads in place and bomber; easy to do this route hammerless. Pitch 11 was the only sustained one but can be well protected if you want to take the time to use surrounding features. Overall a great time up there with a great friend- and his first wall! Congrats Panger! really liked the climb. we did it in a day and then rapped exactly how the topo said not to. got the rope stuck and bivyed in the chimmny above pitch 8 on the South face. didn't see and loose flakes at the top. Did this route in the spring of 06 and don't recall that part being all that bad. We were short fixing and I rope soloed that part, I think i just pulled on a piece and stemmed across. The rock is a little like kitty litter in places up towards the top. Solid but a little crusty on the inside. The spliter on the last pitch is really clean and i think you can link pitch 12 and 13, but we climb on a 65m rope from Yates. Anyone been up more recently and have beta on the loose flake? I recently climbed Skull Queen on Washington Column and would like to warn climbers of a big loose flake on the last pitch. The topo tells about this section as a 5.9 stem between cracks. Move left as soon as possible!! After tree placements I placed a #5 camalot got my foot in the aider and while i applied weight a lot of sand fell out of the crack, the flake moved! I took out the cam to release pressure, the flake sunk half an inch and stayed in place. Lucky me, I finished the climb with no incident. I think the flake can come off very easily so beware. There is also a bathook hole right in the middle of the OW. the OW is no big deal, maybe 12-15 feet in a corner. You can lay back it, I walked a big cam up half free half aid. the bolt is a chicken bolt I assume (and have been told). You can easily link that pitch with the pictch before it. geting to the belay anchor is a bit weird, one of those climb up and over and down jobs...I recomend running the rope on the outside of the huge flake, otherwise cleaning is suxor. How would that OW be on the solo? C1 big cams? Mandatory free climbing? New bolt a chickenjob? sorry no topo in front of me. Otherwise there was very little fixed gear on the route, and I don't think a clean ascent is dependant on fixed gear other then a head or two. Anyone been up this thing in the last couple months? Any recent info would be appreciated. I linked the 3rd to last and 2nd to last pitches with a 60m rope (though it was a stretch for sure). The 2nd to last was what I considered to be the crux (left leaning dihedral-arch). Definitely the best last pitch of any wall on the Column. That finger crack is rad!! Easy, clean and fun I would recommend this especially if those dowels are replaced. The OW isnt that bad and the exposure is fun. Double set of cams is plenty though I don't mind having triples of TCU sizes on walls or a set of offset Aliens will work as well. I think it speeds things up since I can leave protection without worrying about needing the piece later on. Did this route in a 15 hour push during a brief window last week. Not super fast but pretty good with a newbie wall partner. I thought this route was excellent! Four stars, Yeah it has some bolt ladders, but they link nice features. Lots of thin cracks with perfect small brassy and alien placements. Easily done clean, all heads are bomber. I thought the recomended rack was a bit heavy. We used no regular hooks, and few cam hooks. I would bring one cliff hanger and two leaper cam hooks. Tripples on cams seemed to be a bit much. I think you could get away with only doubles. Also you only need doubled on the medium sized nuts HB 4-8, singles on smaller and larger. A 4.5 Camolot was helpfull for the two short wide sections. Bring a few heads and a hammer or a cheat stick. We linked pitch 6-7 and 8-9, easily with a 60 meter and long slings, bring lots. Short fixing sped things up alot as well. The 5.7 mantle on P6 is easy, not even realy a mantle. There is another 5.7 mantle on P11 not marked on the topo (on the traverse just before the belay) that is more difficult. The "5.9 stem" on P12 is more like an easy tension traverse off a 4 or 4.5 Camolot. Good route, much better top-out then the South Face or Prow. have fun! Climbing the Kor Roof this last saturday, October 4th, we pulled the last bolt (while cleaning!). The party behind us found it impossible without the bolt, so jugged on one of our ropes past the roof. They then installed a piece of yellow cord on the first piton in the crack above, with a loop tied in the lower end, which is within reach from the second last (now last!) bolt on the Kor Roof. this route is way better than the south face or the prow! I just did this route a month ago and I though it was pretty good. The dowels are replaced with 3/8 inch button heads that seem pretty/really secure. The first pitches to pitch 5 are good and easy, p5 has many button heads with out hangers so bring wire rivet hangers,p6 was easy for the grade and required a bonified mantle,p7 wide and akward with a rivet out to the right of the wide section bring 2 4s or mix it up,p8 is awsome its thin and takes cam hooks like a dream also bring 2 #1 loweballs or figure it out (you can back clean),p9 is easy for the grade,p10 is akward because of its low angle bring lots of aliens,p11 is long sustained and weird (uncaracteristic of the rest of the route which is lower angle bring two medium to large hooks they (the hooking edges) are hard to find there are two mantels off of hooks at the top of the pitch , p12 is thin and strait foward with a stem and slab move go to the top. our rack included one set of alien offsets which eased the aid considerably (my first time using them) we also had two mid size cam hooks which were very usefull, one loweball #1 and aliens. its a good route off the beaten path.